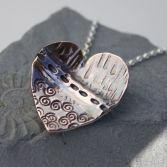 The Fold Formed Heart necklace is exclusive to Julie Brandon Jewellery and has been handcrafted from Copper and sterling silver. To make the Heart i first fold form and textured a sheet of 0.9mm thick copper, annealing it a couple of times (heating until it glows red) which makes the copper softer. Using a piecing saw i then cut out the heart shape and slightly dome it and polish it. I solder on a piece of sterling silver tube to the back for the silver chain. Finally i add a patina (which darkens the copper) to show off the lovely textures, its then re-polished on the high spots to add contrast. 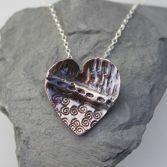 The necklace is suspended on a strong sterling silver Belcher chain and can be ordered in various lengths. The Fold Form Heart measurers approximately 2.5cm wide by 3.0cm long. 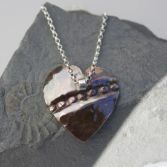 This beautiful Fold Formed Heart Necklace is made to order so please allow 4-5 days from date of ordering. 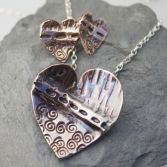 Please note that due to the handcrafted nature of the Fold Form Heart no two will be identical, however the images shown are a good representation of the necklace you will receive. Your Fold Formed Heart Necklace will be presented in one of out signature gift boxes and posted via Royal Mail special delivery (signed for) to any address within the UK free of charge.